The vast majority of today’s jobs require a Year 12 or higher qualification, and employers are looking for people who are flexible, adaptable and willing to learn new things. Completing Year 12 or attaining equivalent qualifications should be the aim of all students in Tasmanian Government schools. Colleges and a growing number of high schools and district high schools offer a wide range of programs and study options. Some subjects are available online or through a shared enrolment with a nearby school. This means you will have additional access to subjects of interest and it may require you to study off campus. Some programs are accessed through Trade Training Centre (TTC) facilities which are designed to provide practical training using industry-standard equipment. Your chosen course may be a combination of these available options. Discuss this with your Year 11/12 course counsellor. For details on where subjects and programs are available go to the Where Do I Study 2019 table. Teachers and other support staff in all secondary schools throughout the state will support your transition from Year 10 to Years 11/12. If you are currently attending a Tasmanian Government school, your Year 10 coordinator or teachers will give you details about how you can access the information you need to enrol in Year 11. Your school will make all the arrangements for your enrolment and you will have the opportunity to attend information and taster sessions. You will enrol through your current school. You can enrol through a college or a school extending to Years 11 and 12 in your region. You should contact the college or school for details to arrange course counselling and enrolment. Contact details can be found at the back of the Guide. The 2019 Student Guide for Years 11 and 12 (PDF, 4MB) is an important tool for you to use in planning your course of study in Years 11 and 12. It provides information on the wide range of TASC subjects and VET courses available in 2019. 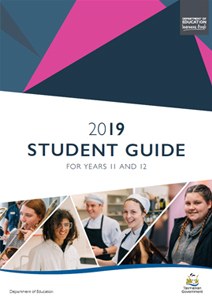 Download a full copy of the 2019 Student Guide for Years 11 and 12. Entry to VET programs usually requires a “suitability process”. This is undertaken prior to completing enrolment to ensure that students commence their VET studies in the most appropriate course and at the right level for your learning needs. It may involve an information session, interview and/or an assessment task or test. It is a prerequisite for enrolment in most VET programs offered in Years 11 and 12. More details will be available from your local senior secondary school.